Go BACK one page for beginning of this von Kienbusch quote. Next day I was asked to be on the watch for these stirrups and if they were offered to me I should ask no questions and buy them. The guards were convinced that some young woman had hidden them under her skirt and had taken them as souvenirs, not realizing their value. This may well be true. As of today, the stirrups are still missing. The guards believe that the person who has them finds them useful, because of their flat treads, as ash receivers, and say that there is little likelihood of their being recovered until he or she dies and the heir disposes of them. Peter, Thanks very much for forwarding this quote from the introduction to The Kretzschmar von Kienbusch Collection of Armor and Arms, privately published in a limited edition in 1963. It cross references very well with other pages on this website. Click on links within the quote above and back one page to see what I mean. Spent the day before yesterday with Burt Hart, whose father was plant supervisor for the Mackay Radio station at Sayville, Long Island and later Brentwood. The photo at the left is an early view of the Sayville facility when it was still being run by the German firm, Telefunken. Telefunken opened the original site in 1912. 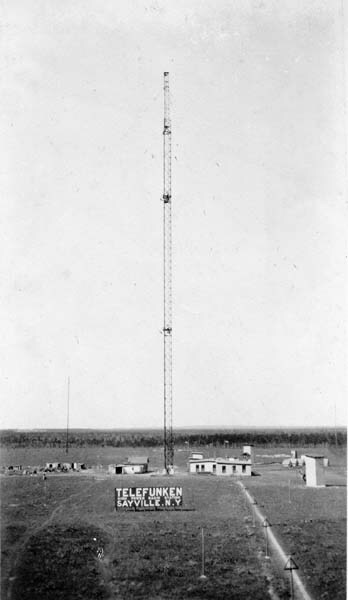 The German station was commandeered by the US Navy when we entered WW I and made a part of the Navy's high power chain, with the installation of a 200 KW Federal arc transmitter. Mackay leased the station from the government in 1927, embarking on a vast upgrade of it. Burt is a treasure trove of info because he lived on the Sayville station site as a boy and later worked at the other Mackay installations on Long Island. Burt, 86, retired from ITT World Communications in 1976. Burt was eight years old when his family moved into the site manager's on-site housing in 1928. The housing was comfortable and even came equipped with a tennis court. I occasionally have lunch with some of the operators from WSL, the Mackay marine station at Southampton. We are losing these operators fast. Two of the group died within the past year and all but one is in his 80s or 90s. I have asked George Flanagan to send some additional information regarding the other Mackay Radio installations on Long Island. His additional information and pictures are being worked into the Mackay Radio pages on this website. Click here to view this expanding information. This site is fantastic. I've been very interested in Long Island's old estates. I've been obsessed with the Pratts for years. I'm always driving around looking for old remnants that are left. How sad it is that so much is gone now. Thank you for this great site. I was over at the Harbor Hill site last year. I wish I knew then that this website was here. Take care. February 9, 2007 MURDER - DETAILS? Are you aware of the 1901 murder of Arthur Gschwind on the Mackay estate? He was my great grandmother's first husband. He worked on the estate and was murdered by a man who lived on an adjoining farm, John Bausch. I am not entirely clear on the reason, but it had something to do with horses or cows wandering across property lines. There was a dispute and Bausch ended up shooting and killing Gschwind. Bausch escaped and Mr. Mackay offered a $1,500 reward for his arrest. Bausch was eventually apprehended in Pennsylvania. If you or anyone else can tell me more about this murder, I would appreciate it. If anyone knows any more of the details concerning the death in 1901 of Arthur Gschwind, please contact me and I will assist you in contacting Nancy Staab. We have found three short articles in the New York Times archive (May and September 1901) that add a little more detail to Nancy's comments above. Bausch was found in Pennsylvania and extradited to New York for trial. His claimed that he shot in self-defense. Outcome of the trial is unknown to us.